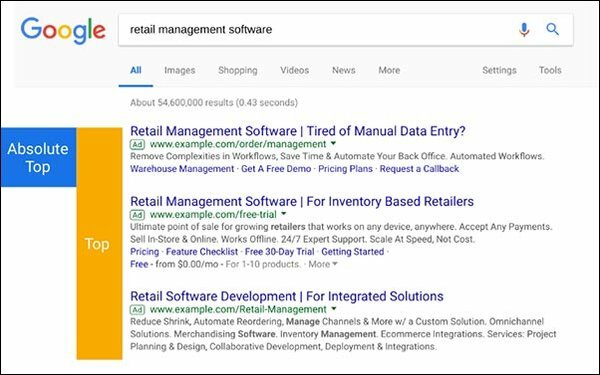 Google’s new search ad position metrics, introduced this week, aim to provide advertisers with a better sense of how their ads will perform based on where they land on the search query results page. Four new metrics will roll out during the next several weeks. Two metrics are based on the top-of-the-page position that Google calls “Absolute Top.” The other two, which appear at the “Top” position, reflect all-around ad impressions that serve up above the organic results. The metric Impr, which appears at the "Absolute Top" of the search results page, represents the percentage of a brand’s ad impression that serves up as the very first ad above the organic search results. The Search (impression share) IS metric also represents a metric for impressions that serves up in the absolute top location, divided by the estimated number of impressions a brand is eligible to receive in the top location. Impr, which appears at the Top, is the percentage of the brand’s ad impressions that serve up anywhere above the organic search results, and not at the very top of the results. Lastly, the Search IS metric represents the impressions a brand receives from ads that serve up in the top location anywhere above the organic search results, compared with the estimated number of impressions a brand is eligible to receive in the top location. The two impression percentage metrics — Impression Absolute Top %, and Impression Top % — are specific indicators of page location. The metrics show when and where ad impressions display above the organic result. The other two metrics tell advertisers what the brand’s share of eligible top impressions is, giving marketers the best indicators of the available opportunity to show the ads in more prominent positions. So when advertisers use the average position to understand the location of the ads on the page, it's better to use Impression, Absolute Top, percent and Impression, Top, percent. When using the average position to bid to a page location, it's better to use Search Absolute Top IS, and Search Top IS, explains Jacquet.